One hundred years ago, World War I was raging just outside the entrance to Cork Harbour. German U-Boats patrolled the south coast of Ireland targeting British merchant vessels. Many were torpedoed and sunk. 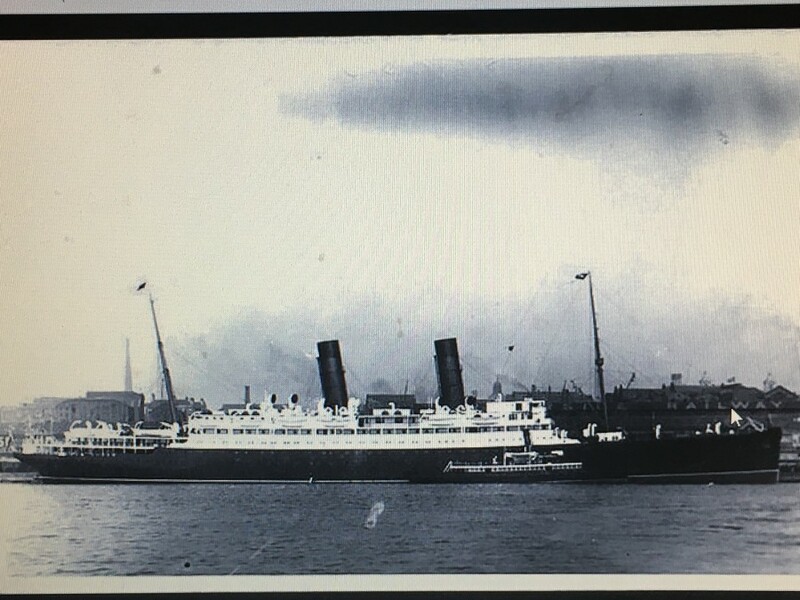 One such ship which met with two torpedoes, one hundred years ago this week, was the Cunard Ocean Liner Laconia. The seven-deck liner, complete with officers’ cabins on the top deck was launched in 1911. It was en route from New York to Liverpool when on on Sunday night, 25 February 1917 it was attacked with the loss of 13 passengers, including three Americans. The death of the Americans influenced the course of the war. A graphic account of the sinking by an American journalist Floyd Gibbons aboard was credited as one of the catalysts in pushing the United States into joining the war after it was read to both Houses of Congress. Both the Gibbons account and the Cork Examiner on 28 February 1917 highlighted the plight of the Laconia, which was torpedoed about (11 km) northwest by west of Fasnet Rock. The first torpedo struck the liner on the starboard side on the stern side the engine room, but did not sink her. The effect of the torpedo explosion caused the big Cunarder to list to starboard, causing some difficulty in lowering the port lifeboats. She soon returned almost to an even keel before starting to settle, and all the boats—eleven in number got clear. By now the submarine had got into position for the firing of her second torpedo. Amongst the last to leave the ship and to jump into the water and swim to the boats were Captain William Robert Duncan Irvine and the chief engineer. The wireless operator, Mr O’Donovan. a native of Kinsale, sent out the SOS call. The ship’s surgeon, Dr Kennedy, a native of County Tipperary made sure that frail passengers were in lifeboats before he took to his own boat. When all the boats were clear and the fate of the Laconia was no longer in doubt the German submarine came up alongside, and the commander opened conversation with a number of queries. His attitude, according to the press, appeared to have been one of cynicism and indifference to the fate of the boats, as when asked if he was aware that he was torpedoing a ship carrying women and children he is reputed to have replied, “Oh, they will be all right; keep on and a patrol will pick you up in a few hours. Good night”. Afterwards the submarine moved off into the darkness. The patrol boat that rescued the boats of the Laconia also rescued the crews of the steamers Falcon and Eires which had been sunk earlier on the Sunday. 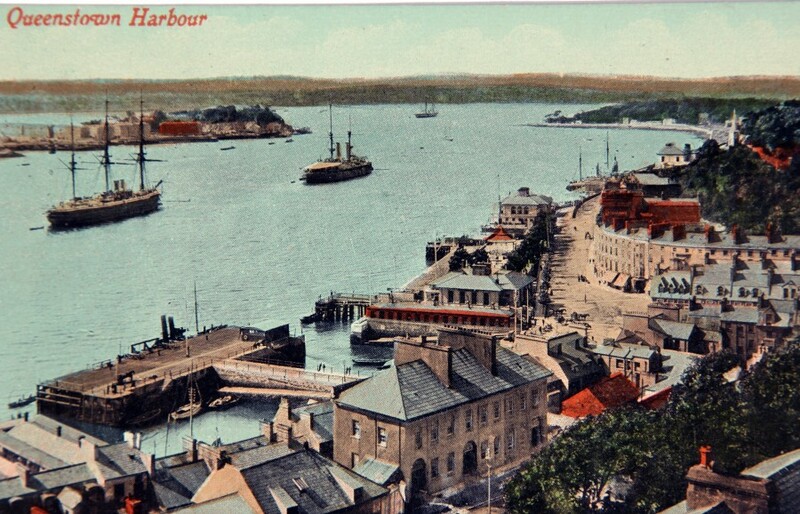 The patrol sloop drew alongside the deep water quay at Queenstown and the people of the town received 277 survivors. Motor cars and ambulances conveyed the survivors to temporary accommodation in the town’s various hotels. A number of survivors, after leaving the torpedoed vessel, spent nine hours in a waterlogged lifeboat, until picked up by a mine-sweeper and taken to Bantry. Such was the impact to the exposure of the elements that out of 21 on the boat as many as seven died, and those included two American ladies, Mrs Mary Hoy and Miss Elizabeth Hoy. Rev V D Sargend, OP, who was travelling from the West Indies to England via New York, to take up an appointment as army chaplain noted that this boat was immediately launched after the torpedoing. There was no superintendence of the lowering of their boat and it hit the stern of the steamer while she was being lowered. Several of the side planks were burst open and it took sea water as it hit the water. From 10pm until 8am the boat drifted without oar or steering gear in this boat with rising water levels. They were not picked up until 3 o’clock that day. Everybody on board had crowded into the bows and stern. The big waves washed those who were in a weakened condition overboard. Mrs Hoy and her daughter, Miss Hoy of Chicago were two of the drowning casualties. There were in all 23 American citizens on the ship and of this 17 were members of the crew. Two of the four surviving American passengers included Rev Father Waring of St Joseph’s Seminary, Baltimore, USA and Mr Floyd Gibbons of the Chicago Tribune. In Floyd account of the sinking of the Laconia he noted; “It was 10.30pm. Then came the five blasts on the whistle. [Gibbons gets into one of 10 lifeboats.] The ship sank rapidly at the stern until at last its nose stood straight in the air. Then it slid silently down and out of sight”. In March 2009, it was announced that the wreck of the Laconia was located and claimed by Odyssey Marine Exploration, Inc, a commercial archaeology company in Tampa, Florida. Britain claimed it is the legitimate owner of the wrecks because, under a wartime insurance scheme, it paid the owners of the vessels when they sank, in effect making the remains the property of the British taxpayer.